Randy Savage (real name Randall Mario Poffo, November 15, 1952 – May 20, 2011) was an American professional wrestler who was best known for wrestling with World Wrestling Federation (WWF), World Championship Wrestling (WCW) and Total Nonstop Action Wrestling (TNA). His father Angelo Poffo (1925-2010) was a wrestler, as is his brother, Lanny Poffo (born 1954). Savage was married to professional wresting manager, Miss Elizabeth until they divorced in 1992. Poffo also released a rap record called, Be A Man which featured a diss track about Hulk Hogan and a tribute song about "Mr. Perfect" Curt Hennig. He died on May 20, 2011 after having a heart attack while driving in Seminole, Florida, resulting in a car accident. On March 28, 2015, he was inducted into the WWE Hall of Fame by Hulk Hogan. He was represented by his brother Lanny Poffo. He was ranked #2 of the top 500 singles wrestlers in the PWI 500 in 1992. He was ranked #9 of the top 500 singles wrestlers of the "PWI Years" in 2003. He was ranked #57 of the Top 100 Tag Teams of the "PWI Years" with Hulk Hogan in 2003. ↑ "Randy 'Macho Man' Savage killed in Pinellas crash". MyFoxTampaBay. Retrieved 2011-05-20. ↑ "Pro Wrestling Illustrated Top 500 - 1992". The Internet Wrestling Database. Retrieved 2013-12-15. ↑ "Pro Wrestling Illustrated's Top 500 Wrestlers of the PWI Years". The Internet Wrestling Database. Retrieved 2013-12-15. ↑ "Pro Wrestling Illustrated's Top 100 Tag Teams of the PWI Years". The Internet Wrestling Database. Retrieved 2013-12-15. 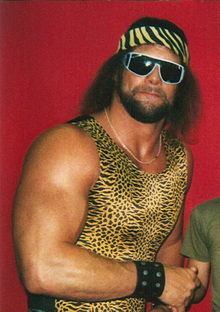 ↑ ""Macho Man" Randy Savage profile". Professional Wrestling Hall of Fame. Retrieved 2013-12-15. ↑ "WCW World Championship - Randy Savage (November 26, 1995 - December 27, 1995)". WWE. Retrieved 2013-12-15. ↑ "WCW World Championship - Randy Savage (January 22, 1996 - February 11, 1996)". WWE. Retrieved 2013-12-15. ↑ "WCW World Championship - Randy Savage (April 19, 1998 - April 20, 1998)". WWE. Retrieved 2013-12-15. ↑ "WCW World Championship - Randy Savage (July 11, 1999 - July 12, 1999)". WWE. Retrieved 2013-12-15. ↑ "World War III 1995: "Macho Man" Randy Savage Wins the WCW World Title in the First Ever 60-man Battle Royal". WWE. Retrieved 2013-12-15. ↑ "WWE Championship - Randy Savage (March 27, 1988 - April 02, 1989)". WWE. Retrieved 2013-12-15. ↑ "WWE Championship - Randy Savage (April 05, 1992 - September 01, 1992)". WWE. Retrieved 2013-12-15. ↑ "Intercontinental Championship - Randy Savage (February 08, 1986 - March 29, 1987)". WWE. Retrieved 2013-12-15. ↑ "Game of Thrones: The Top 10 Kings of the Ring". WWE. Retrieved 2013-12-15. This page was last changed on 20 March 2019, at 07:18.